Aprilia started its India operations with big bikes like the RSV4 and Tuono 1100. Since then, it has been toying with the idea of getting smaller and more affordable performance products to the Indian market. The SR 150 scooter shown at the 2016 Auto Expo and launched last year was the first such example. 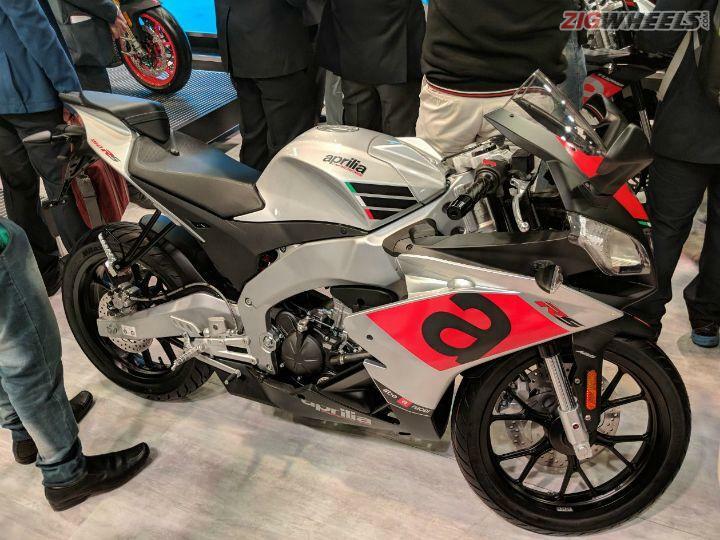 This year, along with the launch of the SR 125, Aprilia also showcased the Tuono 150 and RS 150 bikes at the Auto Expo 2018. These bikes have been brought here to gauge the response from the audience and if well received, Aprilia will launch the duo in India. Unlike the 125cc variants available internationally, India will get bikes powered by a 150cc engine. The RS 150 is a scaled down replica of Aprilia’s flagship RSV4 1100 RF motorcycle. Everything from the headlamp layout to the LED tail light resembles its larger cousin. The fairing also carries the factory racing livery replete with a small, sharp tail unit. It gets top-spec chassis components like a perimeter frame and an aluminium swingarm. The suspension duties are taken care of by 40mm upside-down front forks with 110mm of travel and a rear monoshock with 130mm of travel. The 17-inch wheels are shod with 100/80 section radial tyres at the front and a 130/70 section one at the rear. Braking is via a 300mm front disc with a radially mounted four-piston calliper and a 218mm disc at the rear, with ABS. Both sport metal-braided brake lines too. Given the high-spec suspension parts and the committed riding position, this one should be fun on the track and the twisties. The Tuono 150, on the other hand, is the street version with fairly relaxed ergonomics. By design, it is a scaled-down version of the larger Tuono 1100. Other than that the chassis and suspension setup remains the same. So, expect the dynamics to be quite lively. Both bikes will share the 150cc, liquid-cooled and fuel-injected mill that makes 18PS at 10,000rpm and 14 Nm at 7500rpm. We expect the motor to be mated to a 6-speed gearbox. It also gets a quick shifter as an additional accessory. Of the two, it is the RS 150 that is most likely to make it to India, given our affinity towards faired motorcycles. In 150cc guise, it should compete with the newly launched Yamaha R15 v3.0. If the response is good enough, the bikes could be launched in India by early 2019 at a price of around Rs 1.5 lakh (ex-showroom).